Gorgeous women indian designer Sarees with pure satin and half russel net fabric including unstitched blouse. Get latest designer net sarees, Indian occasional sarees, special festival sarees in best price. Packaging Details INTERNATIONAL standards of packaging. Hoshiyar Singh Suresh Chandra Sarees Private Limited, established in the year in the 1995, is one of the leading exporters, manufacturers, suppliers and wholesalers of the best quality Sarees and Lehanga Cholis in India. The product range offered by us consists of highly assorted collection of sarees with Premium Designer Wedding Lehengas and dazzling Indo-western wear. Due to their alluring designs, vibrant colors, elegant style, vivid patterns and excellent embroidery, these sarees are highly in demand . 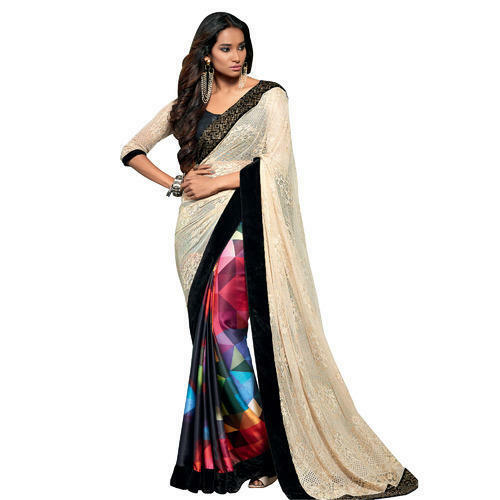 Offered by us at industry leading prices, these sarees are highly appreciated among our customers. We follow various quality assurance procedures while designing the offered range of sarees which are in compliance with the latest fashion trends. With the aid of wide distribution network and logistics, we have been able to meet the bulk demands in the most efficient manner. Some of the countries where we export our product range are Australia, New Zealand, West Indies, USA, Canada, Singapore, Mauritius, France, Fiji Land, East/Middle Africa, Malaysia, Brazil and Europe.